Soan Papdi online market has grown to a large extent these days, because of it’s taste and texture people are buying soan papdi online more now a days. 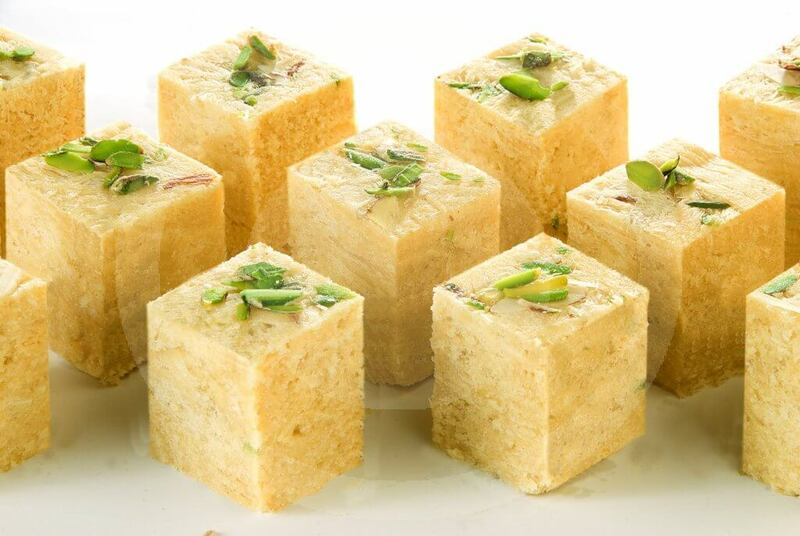 Soan Papdi is a famous Indian sweet that is vastly availabale in Northern part of India. The sweet should be definitely present at the time of festivals like Rakshabandhan, Eid and more. This is mainly made of Wheat Flour, Sugar and edible oil; We at Surdhenu add a secret ingredient which makes our Soan Papdi more tastier compared to others in the market. We have 5 different varieties of Soan Papdi that are selling offline and we are soon entering into Soan Papdi online market also. All the varieties that we offer comes with a great taste and will be a great choice for all the ocassions. These are the 5 different types of Soan papdi that we have in the market. 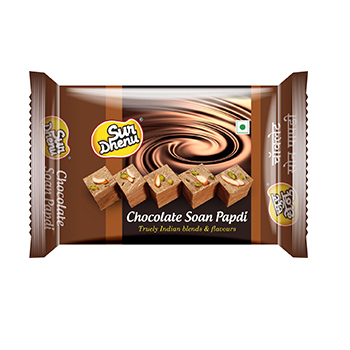 Made of Sugar,Refined Palmolein Oil,Wheat Flour,Chick Peas Flour,Cocoa Powder,Cocoa Mass,Skimmed Milk Powder,Liquid Glucose,Almonds & Pistachio Chocolate Soan Papdi has more taste and is the perfect replacement for Chocolates also. Cocoa powder and Cocoa mass brings the unique taste to the sweet and all the other ingredients are most edible and will satisfy your sugar cravings. Made of Sugar, Clarified Butter ( Ghee ), Wheat Flour , Chick Peas Flour, Almonds & Pistachio, Cardamom ; Pure Ghee Soan Papdi is the best pick for all the festivals and special occasions. We proudly say that this is the best food that can give you the instant energy when required and the Ghee adds more taste and texture for the sweet. Made of Sugar,Edible Vegetable Oil, Wheat Flour , Chick Peas Flour, Almonds & Pistachio, Liquid Glucose, Cardamom ; this is the fastest selling product of Surdhenu Sweets. 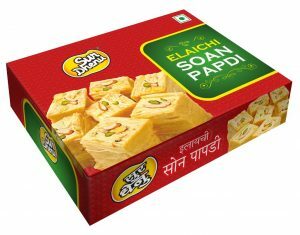 Liked by many and voted as best sweet in terms of taste Elachi Soan Papdi will be the best product to give others for special occasions and festivals. People started to buy Elachi Soan Papdi online and also in shops and they are enjoying the taste with others. Made of Sugar,Edible Vegetable Oil, Wheat Flour , Chick Peas Flour, Almonds & Pistachio ; Orange Soan papdi is most unique and best tasted sweet in our products lane. When you bite a piece you can originally taste the oranges that are grown in Nagpur. 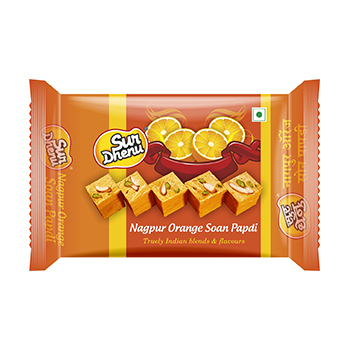 Made by professionals with their own hands the Orange Soan Papdi will give you a unique taste to your taste buds. Soan Papdi online market is growing rapidly these days and we will add this unique product to our Soan Papdi online fleet and you can order them from our Soan Papdi online market. Made of Sugar,Edible Vegetable Oil, Wheat Flour , Chick Peas Flour, Almonds & Pistachio, Liquid Glucose, Cardamom; Elachi Soan Papdi Roll is new addition of our Soan Papdi fleet. Generally Soan Papdi will be of cubes and this shape is common in every part, So to eradicate the monotony Surdhenu has came up with the idea of Soan Rolls which has the same taste of Elachi Soan Papdi and the new shape will add some more sweets to your belly. We are also planning to add this to our Soan Papdi online market. With the advent of Internet and E-commerce Soan Papdi is going online and is reaching to more number of people. 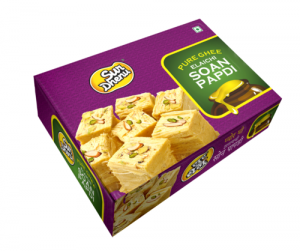 We can buy soan papdi online where each transaction consisting of soan papdi online purchase, companies are giving huge discounts to the buyers. Surdhenu is selling Soan Papdi online to the retailers by their Mobile Application and they are giving great discounts on each purchase. 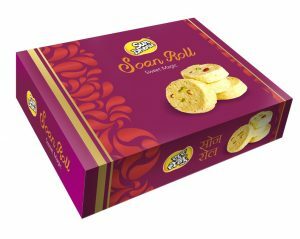 Soan Papdi online buy is a very easy task now as Amazon and other E-commerce markets are selling the Soan Papdi online on their portals.